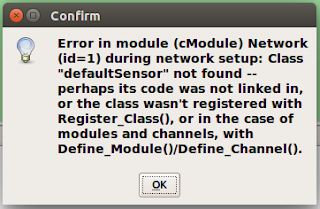 Error in module (omnetpp::cModule) ag (id=1) during network setup: Class "blogkafem" not found -- perhaps its code was not linked in, or the class wasn't registered with Register_Class(), or in the case of modules and channels, with Define_Module()/Define_Channel(). At first you suppose this problem caused by linked problem of Eclipse (it is avaible and default omnet editor). Almost, all of the web sites are focusing on this sitution to solve this problem (you probably know, if you had searched on google). This approach is prettym much correct. In this article, I focused an other reason which is caused this problem. Pay attention to name of the class. Its name is "blogkafem". Pay attention again to name of the class. Its name is "blogkafem". You must care of the name of this class. If you give same names to these classes, you don't get any error message. If you give different name, you will get error message included "class not found". Hi all. I am Ali Arslan. I am an computer engineer. I have blog page. Its name is Blogkafem. I have been writing for ten years. I wrote first article 3th January 2008. I am Turkish and I live in Turkey. Thats way I am writing in my blog with Turkish. One day, I wanted to write my blog articles with English language. So that I considered to publish Blogkafem.net English Edition. My English is not perfect for now. But I think it will be better in the future. Sorry in advance, If I write with wrong English gramer in this blog.